The Breathe app on your Apple Watch encourages you to set aside a few minutes a day to relax and focus on your breathing. Open the Breathe app on your Apple Watch. Tap Start, inhale slowly as the animation grows, then exhale as it shrinks. Turn the Digital Crown to increase the duration. You can choose a time between one and five minutes. To set this as your default duration, open the Apple Watch app on your iPhone. Tap My Watch, tap Breathe, then turn on Use Previous Duration. You can change how frequently you get breathe reminders, mute breathe reminders for the day, and change your breathe rate. Set breathe reminders: Tap Breathe Reminders. Change your breathing rate: Tap Breathe Rate to change the number of breaths per minute. Tap Health Data, then tap Heart. Swipe left on heart rate to see Breathe. Add the Breathe watch face to get quick access to breathe sessions. With the current watch face showing, firmly press the display. Swipe left all the way to the end, then tap the New button (+). 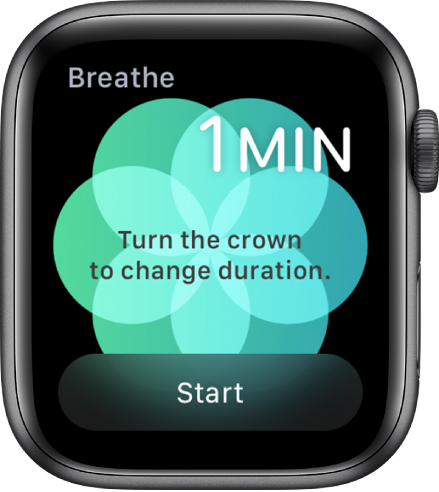 Turn the Digital Crown to select Breathe, then tap to add it. Tap the watch face to begin a breathe session.